The Geotrail Dos Capèl path has been completely renovated thanks to the collaboration with the Museo delle Scienze (Scientific Museum) of Trento and the Geological Museum of the Dolomites of Predazzo. Along the path are 13 stations illustrated by the Portuguese artist Bernardo Carvalho. While out walking, you will discover the countryside, gather clues, recognise rocks: Werfen, Basalt, ancient marble, traces of lava, Latemar limestone. “Baked”, broken and folded rock, coral cliffs, vuclanic veins, dolomite colours and lanscapes of extraordinary beauty. The Geotrail Dos Capèl path is of medium difficulty for children and families. With the bubble car you will arrive at Gardonè, continuing with the chairlift as far as Passo Feudo: the Geotrail Dos Capèl starts from there. The walk consists of a 3,5 km loop, with a vertical height gain of 268 m. Start and finish at the same point, just a few metres from the Rifugio Passo Feudo. If you would like to take part in a special adventure come on a Wednesday. You will see the show called “Geology on the high seas”. Where is Guido? He’s coming. He’s waiting for the actress. She should have been here. But actresses between makeup, trying on their costumes and choosing which shoes to wear, take forever. Do we need a substitute? “Oh if he could do a tectonic push. If I say “token rock” will he understand what to look for? Let go of the lava embrace? Never fear, Guido is coming. If you are asking what the connection is between sea and mountains, on the Geotrail Dos Capèl you will be able to recognise the rockfaces of the Livinallongo formations, the brown veins of lava and traces of a Triassic sea. That is exactly right, if the outline of the Latemar mountains resembles an atoll you weren’t mistaken. 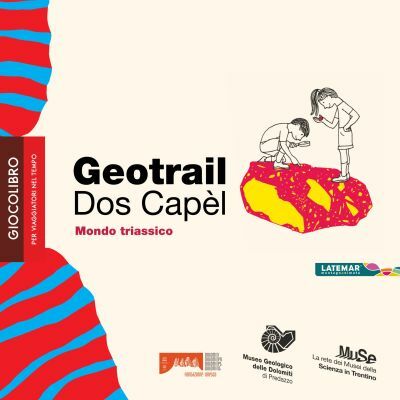 The “Geotrail Dos Capèl, Triassic World” for time travellers is the playbook produced by the Muse of Trento and the Geological Museum of the Dolomites of Predazzo. There are 9 stations, 100 points to accumulate and a handful of token rocks, 9-Geo questions, 1 geologist’s back pack which has: a lens, glasses, bags and gloves to observe the rocks and pick up some samples. 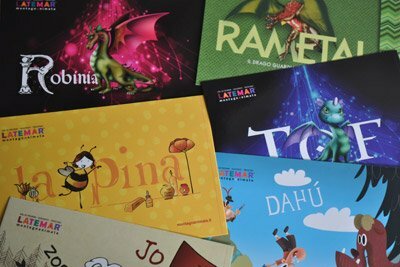 The illustrations are by Bernardo Carvalho, co-founder of Planeta Tangerina, book illustrator for children and kids. Reach Rifugio Passo Feudo – with the chairlift you reach Gardonè in 10 minutes – and follow the path. With the playbook you will discover the Monti Pallidi mountains and you will learn how to recognise rocks. There are 5 token rocks, with different colours and grain; smooth or coarse, with crystals or fossils. You will have to observe them from nearby to recognise them and win points. At the end of the itinerary pass by the Info Point: you deserve a prize. To complete the collection “Findadragon Adventures” here comes Goira the dragoness of the Alps to explore the Dragon Forest. She is afraid of a particular danger. Her dragon friends have been attacked by an invasion of dragon fleas. Cheeky insects that cause a terrible tickle. There’s nothing to laugh about, if the dragons lose their concentration while flying they can crash into the moth trees. Will Goira manage to fight off the ‘funny’ fleas with her powerful liquid flames? You can be guided through the Dragon Forest by the playbooks. You can choose to go off with Ais, Ardea, Goira, Kromos, Rametal, Rogos and Zoira. 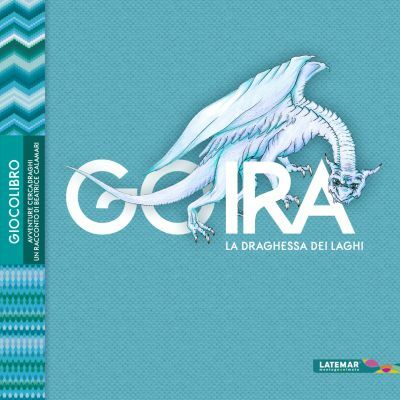 The Findadragon Adventures have been inspired by the book by Beatrice Calamari, “The Dragons of Latemar”, where it all began. 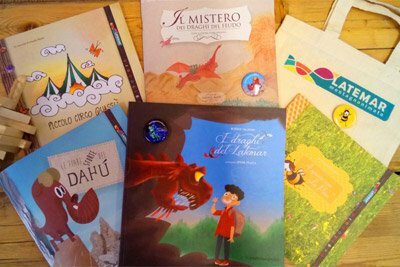 The book is illustrated by Simone Frasca, author of ‘Bruno lo Zozzo’. Martìn and Mì take you along the DISTRACTED SHEPERD path. 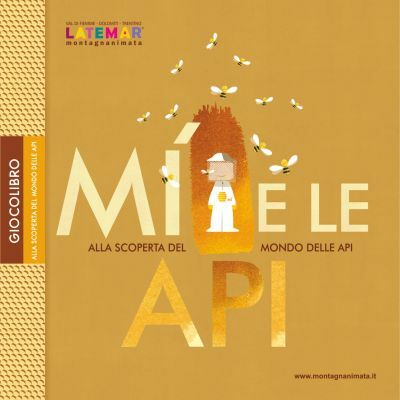 The playbook “Mì and the bees” invites you to discover the busy and fragile life of bees. You will learn how a beehive is made, how pollination occurs and all about swarming. In the end you will know how to choose the precious products which are given to us by bees. Only delicacies which are good for you. “Mì and the bees” challenges you to solve riddles, go in and out of a little maze, find the match. Everybody ready? “The Distracted shepherd and grandpa’s secrets” is a curious dialogue between two generations of shepherds. Martìn cannot resist having his grandfather all to himself. His grandfather was his first teacher, and he learned from him how to recognise animals and wild plants. But he still doesn’t know all the secrets of making really good milk and, worse still, he doesn’t know Salvanel. With this well assorted couple you can enjoy playing with the clouds. Do you want to find out more? Every Thursday the performances take place in the amphitheatre, a quiet corner amongst larch trees. On this natural stage, the fantastic tales take turns, with Otto il Bassotto, Pino Costalunga, Simone Frasca, Cristiano Marin, Nicola Sordo and Michele Comite. What brings them together is a hint of madness and the capacity to make you travel with your imagination. During the week, from Sunday to Wednesday, there are lots of itinerant shows along the three themed paths of MontagnAnimata (Animatedmountain). It is the same company of actors and characters, and this year there are lots of new things too. The search of the Dahú continues. Every Tuesday, the appointment at Gardonè with two special scientists. The Dahú is a rather unusual animal: with two long legs and two short ones it looks rather strange. With new instruments to investigate and make reports coming from all over the world, our scientists will scrutinise the hypothesis that the Dahù may be able to move backwards, as maintained by the steepness theory. The survival of this animal is at stake and to which 4 writers have even dedicated a book. “The crooked fables of Dahù” mixing reality with fantasy. The MontagnAnimata experience shows that theatre, research, games and traditions can be mixed up together. Creating a dialogue between experts and actors works. Recounting ancient knowledge in a simple way is possible. Being part of a team or with the family, while discovering the beauty of the territory, is good fun. And whoever goes back down into the valley will recount the taste for discovery. 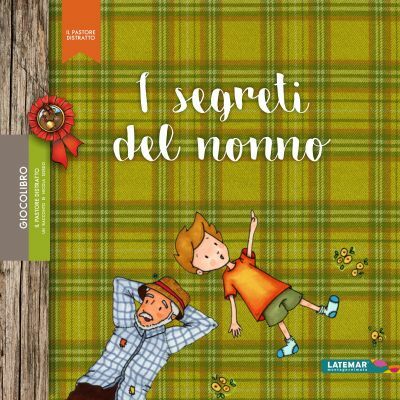 From this year, the playbooks of MontagnAnimata are available in the bookshops in the valley, the libraries of Trentino and at the Punto Info at Gardonè. They are all unpublished stories, born from the desire to make the territory of the Latemar mountains well known and get children to play and be involved in its discovery. At the end of the easy walk along the paths, for those who have completed the playbook – solved the clues, coloured, drawn, found the right words – there is a super prize waiting for them at the Punto Info at Gardonè. 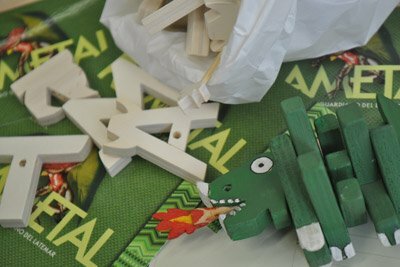 The prizes are all different: some are made from wood, in the shape of the characters of MontagnAnimata. Remember Tof, La Pina, il Dahù? Yes! The prizes in wood have been made by Luigi, a craftsman with hands of gold from Val di Fiemme. You can also receive a coloured headscarf as a prize, to keep the sun off, a souvenir of the Latemar mountains, a board game for the little ones and Zop’s yoyo! As well as prizes there is a nice little postcard with the characters from MontagnAnimata. If you think something then you can say it! To your aunt who lives far away, to your best friend from school, the swimming teacher who cheers you on. Often children have lovely thoughts which they would like to share, but the moment is never right. Stick on a stamp, write the address and off it goes. If it is for somebody you see every day then get there a few minutes early and have it waiting for them there.